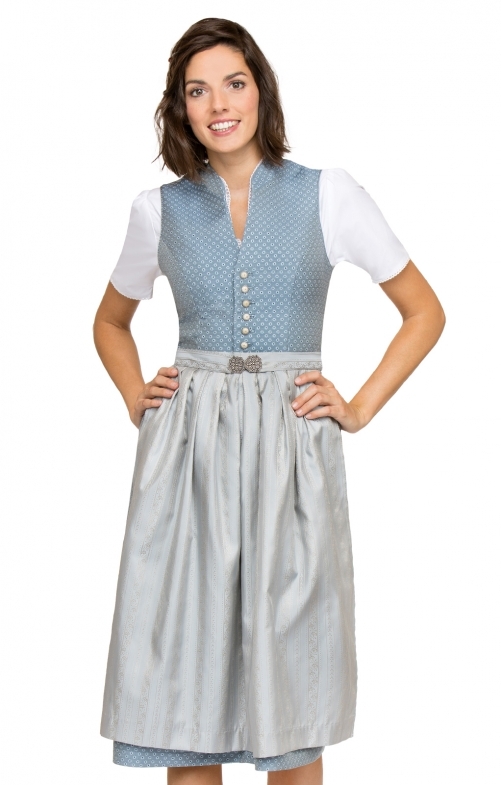 Midi Dirndl Eloise for women by Stockerpoint in smoke blue and taupe. The classic dirndl made of exclusive jacquard fabric impresses with its high-necked bodice with V-neckline and raised collar. The hand-made, very elegant buttons with flower optics fit perfectly into the overall appearance. The feminine, pleated skirt is stylishly finished and equipped with a side pocket. The apron in the striped design is decorated by a, skilfully staged traditional costume clasp.